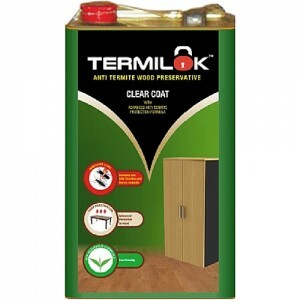 Termilok has advanced anti termite protection formula that penetrates deep into the wood and is highly effective against termites and borers and thus helps in increasing the life of the wood. Usage of Termilok has several benefits such as it Prevents and kills Termites and Borers instantly, Penetrates deep into the wood and is Eco- Friendly and easy to apply product. Termilok is a ready to use colorless wood preservative which is eco-friendly and harmless to human beings and pets. The product is highly appreciated for its efficacy on termites and borers of all kind and is widely accepted as a High Efficacy & Durable Wood Preservative in India.